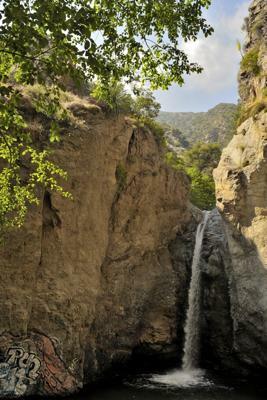 I am certain that Eaton Fall is at least 50 feet based on my personal experience; and the guy who wrote “Trails of the Angeles” says it is 60 feet, I believe. 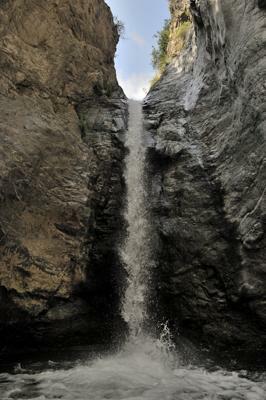 Additionally, there are many more falls above Eaton Fall. (I have included two pictures of the first one above it.) There were probably 8-9 more falls and cascades of varying sizes from 4 feet to the one at the gully, which is probably about 50. It was an 11 hour round trip with many obstacles to get to the gully, which I did not figure out how to get past. (I do not have any digital pictures of the canyon above the pictured fall, only film.) Above the gully, there are a few more falls as well. Five of us made the trip, with a little help from a little bit of rope and some well-placed logs, which are probably all washed away by now with the rains this year.